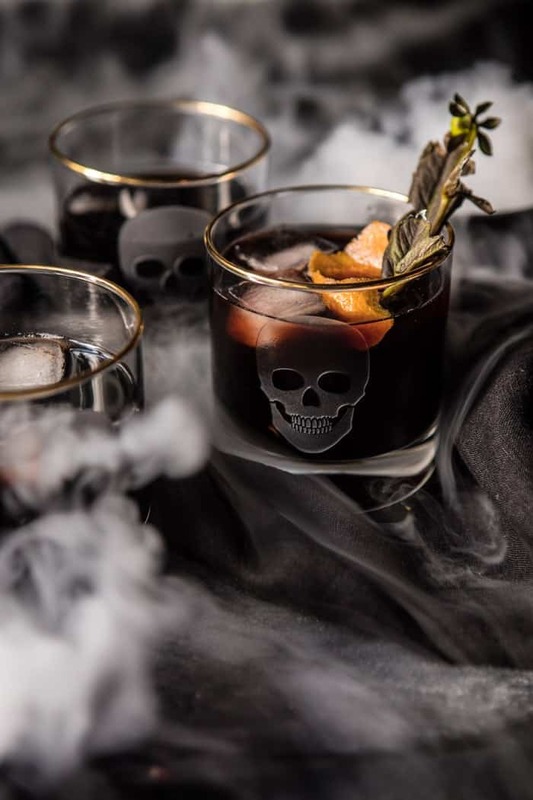 I am kicking off “spooky” cocktail Saturday today with this Death Eater Negroni. If you’ve been reading HBH for any amount of time now, then you know that I am a just a little Harry Potter obsessed (leave a comment if any of you readers out there are as obsessed as I am). I grew up with the books and movies and I think I will forever love the series. Honestly if I could, I would forget everything I know about Harry Potter just so I could go through the books and movies again like it was the first time. Yes, I am that much of a freak…I mean to a point. I don’t have posters on my walls or own any memorabilia, I just love the series, and come Halloween time I LOVE creating a few Harry Potter themed recipes. Takes me back to my younger self, which at times I am very much in need of. 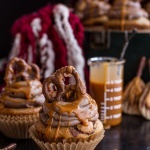 Last year I created this Forbidden Forest Chocolate Butterbeer Cake, the year before it was this Pumpkin Butterbeer Hot Chocolate, and the year before that it was these Death By Butterbeer Cupcakes. Over in the Half Baked Harvest Cookbook I have my very favorite Treacle Butter Apple Pie. So yeah, I kind of like the HP themed recipes. As mentioned today is the start of “spooky” cocktail Saturday. Every Saturday in October I’ll have a fun and spooky cocktail to share. SIDE NOTE: from now until Christmas I’ll have holiday cocktails coming every Saturday…very excited about this. Today’s drink is a simple, but delicious one. A Negroni is a new to me cocktail, but after a little reading I realized that it’s really just a simple mix of equal parts gin, Campari, and sweet vermouth. 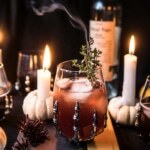 Normally, I am not too much into gin, nor is anyone in my family, but I really wanted to put a spooky October twist on this cocktail, so I added one of my favorite autumnal ingredients, a splash of pomegranate juice. Not only does the pomegranate juice give the drink a nice dark color, but it also adds some sweetness, which I like when paired with the gin. The best part though? This cocktail requires nothing fancy. Mix everything in a glass, add ice, and you’re done. The real fun comes with the dry ice. 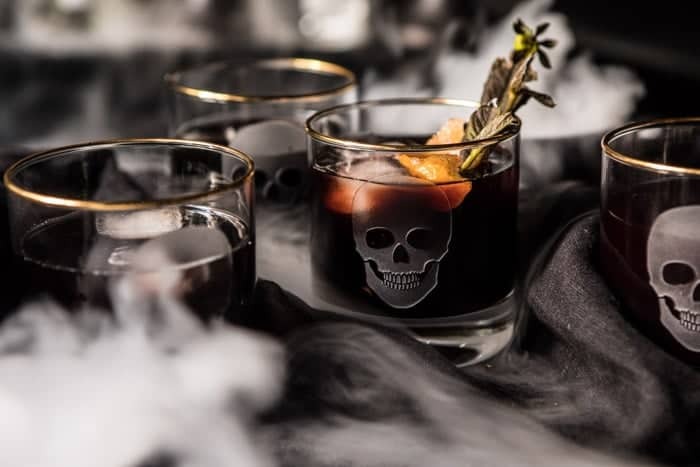 If you guys did not notice, I love playing with dry ice around Halloween and it was PERFECT for this Death Eater Negroni. 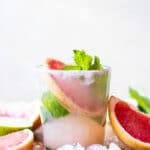 I don’t recommend adding the ice directly to the drink, but I like to place the ice in water glasses around the drinks. I also colored each drink with the tiniest pinch of activated charcoal to give the Negroni a redish-black color. 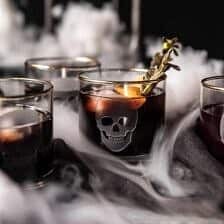 The activated charcoal (which is actually very healthy for you – see this article) is by no means a must, but it does create a darker, moodier drink that gives you that “death eater” feel. Also? My Old Fashioned Skull Glasses that I found via Williams-Somona helped a lot too…I highly recommend investing in these if you plan to make some cocktails this month, I love them. 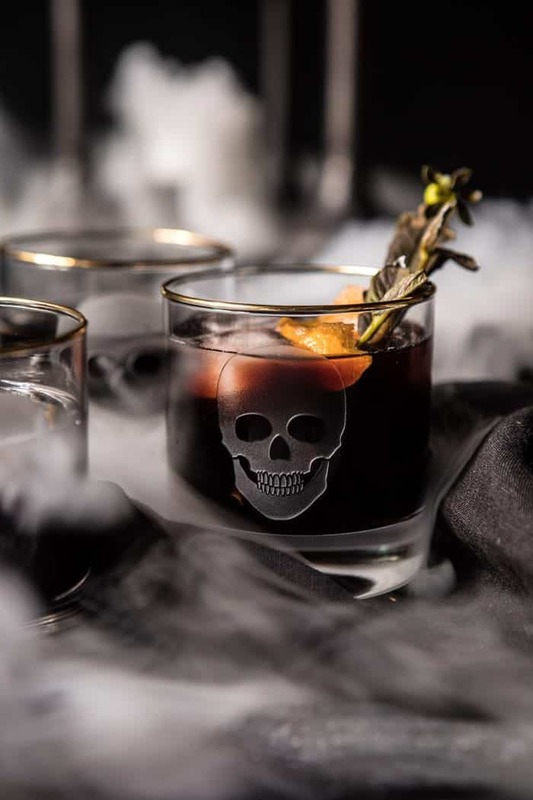 Seeing as tomorrow is the start of October I am thinking you should be kicking things off with this Death Eater Negroni. It’s the perfect way to say hello to October, the month of all things spooky and haunted! A Negroni is a simple mix of equal parts gin, Campari, and sweet vermouth. I added one of my favorite autumnal ingredients, a splash of pomegranate juice. Not only does the pomegranate juice give the drink a nice dark color, but it also adds some sweetness, which I like when paired with the gin. The best part though? This cocktail requires nothing fancy. Mix everything in a glass, add ice and you're done. 1. In a cocktail glass, combine gin, Campari, sweet vermouth, and pomegranate juice. If a black color is desired, add an 1/8 teaspoon activated charcoal and stir to combine. 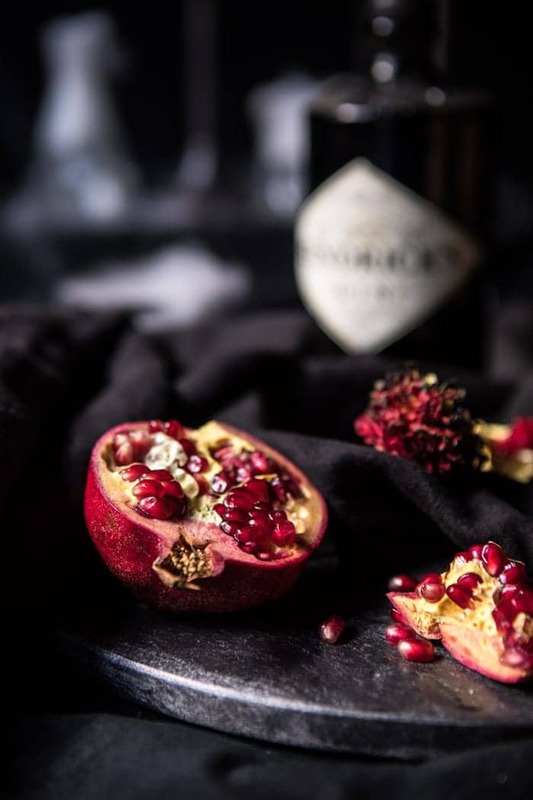 Top the glass with ice and garnish with an orange twist and pomegranate arils. 2. 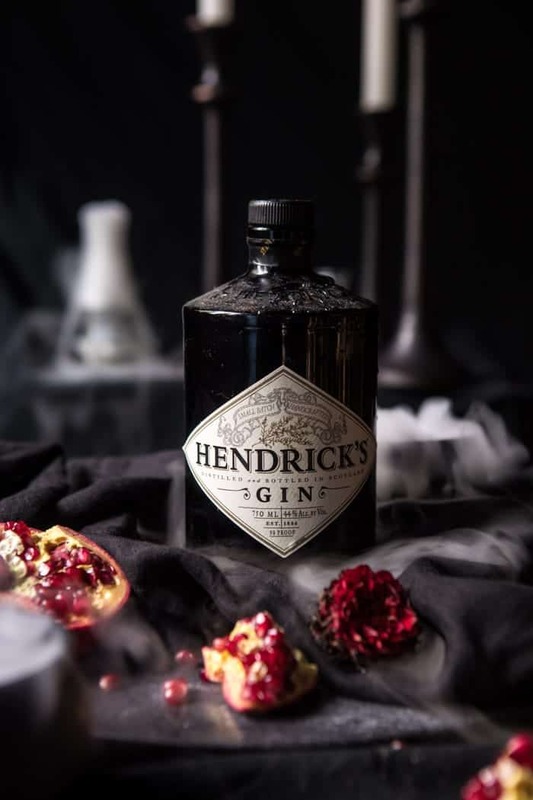 For a spooky effect, you can add a dying flower to each drink. Have a great Saturday, see you tomorrow for another favorites post! I love Harry Potter! We are actually in the middle of watching the 2nd one 🙂 My fiancé finally decided to become a fan! I don’t really like gin but I might try this one! I hope you like it! Thank you Jennifer! I have to say, your photos are always gorgeous but…..
stunning. I want those blown up and framed-seriously. My family is loving you! thank you for your creativity. Awh thank you Kim, I am so glad you like the photos! and I hope you love the soup!! If you haven’t played Hogwarts Battle (board game), you’re seriously missing out! I have not! I may just have to get it! This is fantastic. Well done. You have inspired me for this wonderful time of year. Cheers. These sound tasty! I’m putting these on my “must make” list for our Halloween party this year! Awesome! I hope you all love it! So happy you like this! Er Meh Gerd – I’m obsessed with your food photography. I can’t wait for your studio barn to be finished so I can attend a workshop of yours. The smoke shots are literally blowing my mind. Simply amazing! Awh thank you so much Christina! I LOVE Harry Potter!!! I received my cookbook a few days ago and I love it so, so much, you did an absolutely fantastic job. And I was always wondering what the infamous treacle tart from Harry Potter tasted like, so I will definitely try the Treacle Apple Pie! I love apples, so I think I will like your recipe even better than the plain treacle tart Harry had. And I feel you!! I so wish I could read the series again for the first time!!! Sadly, that’s not possible, but I will definitely be having a Harry Potter marathon with my equally Harry Potter obsessed cousin this autumn! Everything about Harry Potter just screams autumn to me and – circling back to your recipes – I love your Harry Potter inspired recipes! Have a great weekend! This makes me so happy to hear!! Thank you Cati! Ooo sounds so good! Thanks Kristen! I admit I’m not a Harry Potter fan (sorry lol), but this cocktail is amazing whether you’re a fan or not! Love the skull glasses too. I like your new glasses and am looking forward to some more spooky recipes! That is so awesome! I totally need to watch them soon! Thank you Kristin! 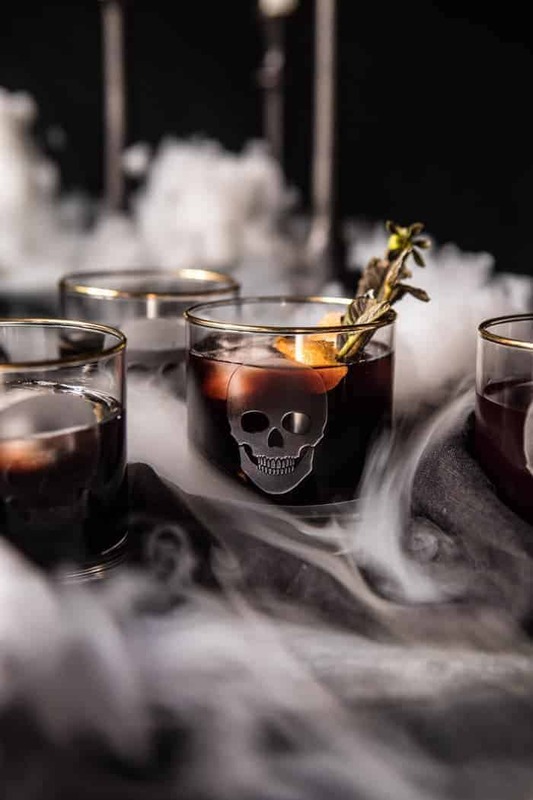 Tieghan, I am loving everything about this post: the cocktail, the skull glasses, the dry ice (I mean… DRY ICE! 😱) it’s all awesome. I’m a fan of the Harry Potter books, but never got into the films, I think they distorted the images of the world that I had built in my head! Awh I am so glad you like these James, thanks! I’ve been reading HP for such a long time. I remember how we had to wait for Book #5 for years. It was agony. The weather here has been perfectly spooky: very dense fog, windy and rain, rain, rain. If I had all the ingredients for this cocktail, I’d make it for sure. And I love creating Harry Potter themed recipes too! Just the perfect weather for this! Oh and yes waiting for that seemed like forever haha! Thank you Sirkku! Tieghan, are you going to try to see Harry Potter and the Cursed Child on Broadway? Registration (to get a chance to get tickets) is open until October 5! I saw it in London and highly recommend it! I’ll be going again if I can get tickets for the Broadway production. I have not made plans to, but that sounds so awesome. I’ll definitely look into that, thanks Sloane! So fun! Love this idea and the smoke totally makes these photos! LOVE the Harry Potter recipes. As someone who also grew up with the series, then the movies, I really appreciate the *grown up* Harry Potter cocktails! I would love to have a Harry Potter party – ultimate goals. You totally should have a Harry Potter party, that would just be the best. Also so glad you’re liking these Harry Potter cocktails, I had the best time making these! I hope you love them, thanks Libby! This looks so good and the fact that it’s HP themed makes it even better!! I’m a huge HP freak, too, and still sad that I never got my letter. Haha right?! I hope you love these cocktails Cassidy! Thank you! I need this drink in my life. My favorite cocktail, my favorite holiday, one of my favorite books……AMAZING. Yes! So glad you’re liking this! Thank you! i am SO that much of a HP fan too! i wish i could read them all for the first time again….seriously the best. 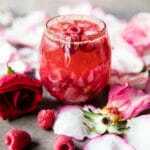 Thank you for sharing many new cocktail recipes, planning on trying more next week. As always, your photographs are amazing! Hi Lena! I am so glad these were a hit for your poker party! Thank you so much!